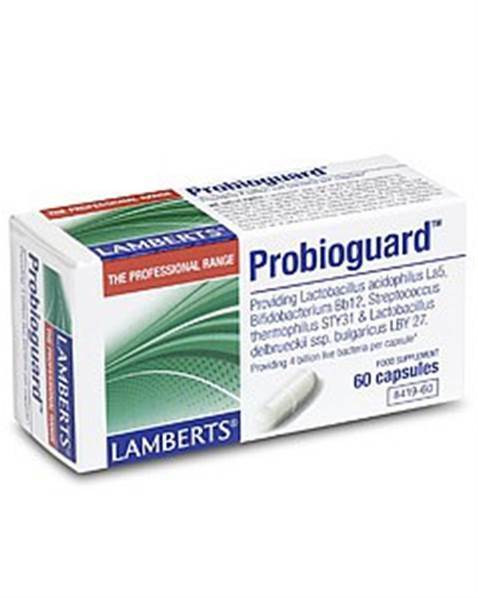 Lamberts Probioguard - 4 strains of friendly bacteria, specially selected for travelling, for after antibiotics and for bloating and digestive disturbances. Probioguard® contains four carefully selected strains of friendly bacteria, Lactobacillus acidophilus, Bifidobacterium, Streptococcus thermophilus and Lactobacillus delbrueckii ssp bulgaricus, which have been widely used in clinical studies. These species of bacteria are specially selected for use when travelling, as local cuisine can expose the gut to new challenges where different bacteria strains may be present and this can unsettle digestion. People with regular bloating problems or on-going digestive disturbances. This product is stored in refrigerated conditions until despatch to ensure maximum potency. The special pot also contains an inbuilt desiccant, as viability of probiotics is largely determined by the moisture content of the atmosphere surrounding the capsules. This product is suitable for people of all ages. *at the time of manufacture. Take two capsules daily one in the morning and one in the evening. Take with a glass of milk water or with a meal. Do not swallow capsules with hot drinks as heat kills bacteria. Take at least 2 hours after antibiotic medication. Not suitable for milk allergy sufferers due to the methods used in the manufacture of this product. To be stored in a cool dry place and protected from light prefereably in a refrigerator.